A rare Ettin sighting at Gameware! Ettins (Cyberlifogenis kleptomonicus) were created by the Shee to help them on different tasks like experimenting or building. 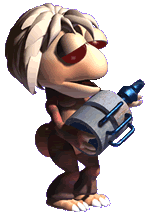 Before the Lone Shee left Albia using the volcano's power, he told the Worker Ettins how to re-build Albia after the eruption, creating the Creatures 2 Albia. 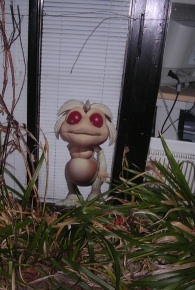 On the Shee Ark there are the Desert Ettins, which used to help on the Shee's experiments and therefore love machines so much, that they always look for machines and bring them to their home, the Desert Terrarium. Because of the tales that speak of Ettins building cities, Ettins are used a lot in Fan Stories as creatures that can tidy up or be left behind to help Norns. Ettins are also well-known for their lack of a tail, giving them a slightly humanoid appearance; and their tomato-like eyes in Creatures 2. Ettins first appeared in Creatures 2, where they usually lead a sad and lonely life underground with no one but the snails, Pitz, and the occasional Grendel for company. In Creatures 3 they usually walk through the whole Ark looking for new machines they could steal and bring to the Desert Terrarium. In Creatures Playground you can unlock an alien which is an Ettin technically. Ettins do not exist in Creatures 1, Docking Station, or Creatures Adventures. However, they can be added via addons or docking them to other Creatures games: Using C12DS, Creatures 1 can be "docked" to Docking Station, which can be docked to Creatures 3. Creatures Adventures can be merged with Creatures Playground, making it possible to have the "alien ettin" in Creatures Adventures. In mythology, the Ettins were two or three-headed creatures who liked to ask riddles. They can also be found in many books, movies and computer games, in which they often are two-headed giants or trolls, whose heads each have their own personality. Browse the list of Ettin breeds! This page was last modified on 16 August 2016, at 22:46.